Our novel oral formulation of the small molecule drug nalbuphine is unlocking new market opportunities and the potential to significantly improve the quality of life of patients suffering from the serious symptoms associated with chronic neurologically mediated conditions for which there are few, if any, treatment options. Nalbuphine ER has a dual mechanism of action, acting as both an antagonist (blocker) to the body’s mu opioid receptor and as an agonist (activator) to the kappa opioid receptor. 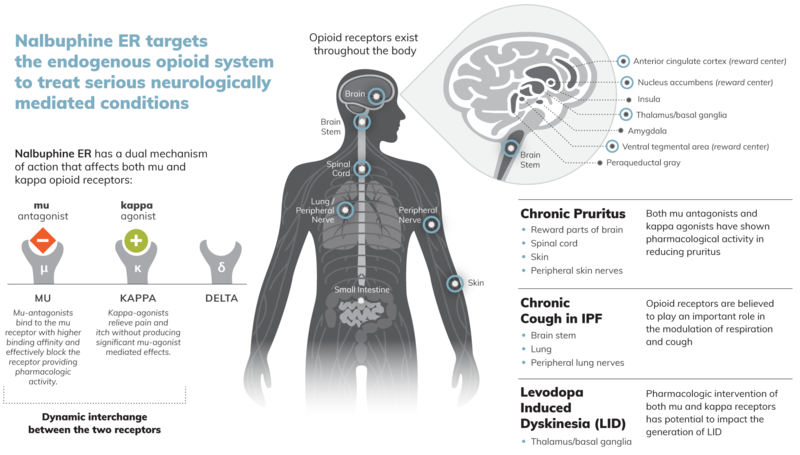 The kappa and mu opioid receptors are known to be critical mediators of the urges to scratch and cough, as well as of certain movement disorders. Nalbuphine’s mechanism of action also mitigates the risk of abuse associated with mu opioid agonists because it blocks the mu opioid receptor. In its injectable formulation, nalbuphine has a long history of efficacy and safety. It’s been approved for more than 20 years in the U.S. and EU for relief of moderate to severe pain in the hospital setting and is currently the only opioid that is not classified as a controlled substance in those geographies. The founders of Trevi were previously involved in the formulation and development of this oral, extended release version of nalbuphine that extended the plasma half-life from ~2 hours to 9 hours, enabling twice-daily oral dosing and opening up its potential use in patients with a variety of serious symptoms caused by chronic neurologically mediated conditions. We are currently developing nalbuphine ER for the treatment of chronic pruritus, chronic cough in patients with idiopathic pulmonary fibrosis (IPF) and levodopa-induced dyskinesia (LID) in patients with Parkinson’s disease. These conditions share a common pathophysiology that is mediated through opioid receptors in the central and peripheral nervous systems. Due to nalbuphine’s mechanism of action as a modulator of opioid receptors, we believe it has the opportunity to be effective in treating each of these conditions. We have completed clinical trials in two distinct and serious pruritic conditions: pruritus associated with prurigo nodularis, and uremic pruritus. In these trials, we treated more than 400 patients with different doses of nalbuphine ER, generating positive results in these two difficult-to-treat pruritic conditions, and demonstrating a favorable long-term safety profile. We conducted a Phase 2 clinical trial in 63 patients with moderate to severe PN. A post hoc analysis of 50 patients completing 10 weeks of treatment with nalbuphine ER 162 mg twice daily showed a statistically significant mean reduction in itch intensity compared to placebo. A pruritic condition occurring in patients with chronic kidney disease typically receiving dialysis; affects an estimated 70% of patients on dialysis in the U.S., causing significant impairment in patients’ quality of life and increased mortality. We conducted a Phase 2b/3 study enrolling 373 patients with moderate to severe UP. Patients receiving 108 mg of nalbuphine ER twice daily showed a statistically significant mean reduction in itch intensity compared to placebo. Due to its dual mechanism, Nalbuphine ER is in a class of its own and, we believe, is well suited to address pruritus and other dermatologic, metabolic, hematologic and neuropathic conditions that represent large markets with significant unmet medical needs. For more on our global Nalbuphine ER clinical development programs, please visit our Pipeline page. Chronic pruritus is itching that lasts longer than six weeks. It causes a number of physical and psychological issues that substantially impact patients’ daily well‑being. The urge to scratch can be unbearable, and the act of scratching can remove layers of skin and break the skin barrier leading to bleeding and scarring and greatly increasing the risk of infection. Chronic pruritus is a hallmark of many dermatologic and systemic diseases and is the predominant reason that patients with these diseases experience so much discomfort. A report published in the Journal of the American Academy of Dermatology estimated that up to 26% of the worldwide population will suffer from chronic pruritus at some point in their lives. According to the Global Pruritus Therapeutic Market Research Report issued in 2017, pruritus therapeutics was a $10.8 billion market in 2016 and is expected to grow to $14.3 billion in 2022. There are no drugs approved in the United States or Europe for the treatment of moderate to severe pruritus.